Time to risk the scorn of those who pooh-pooh anything larger than will fit in their pocket. This is a big radio. It also happens to represent one of the most beautiful and delicately balanced designs to come out of Sony in the fifties. The TR-74 has a lot of class, enough that it earns the praise and admiration of even the non-radio types who visit my home. Somewhat unique amongst portable radios, the face and rear share the same "mirror-image" design. The picture above shows the radio from the front, but the only easy way to tell which way it is facing is to check the relative position of the telescoping rod antenna and band selector switch. Speaking of the band selector switch, (the knob that looks like a second telescopic antenna to the right of the clear plastic cover for the tuning dial), it is a nice primitive-feeling affair. You pull the switch up and feel the solid click of a mechanical lever when selecting the short wave band, and push it back down to catch tunes on the AM band. 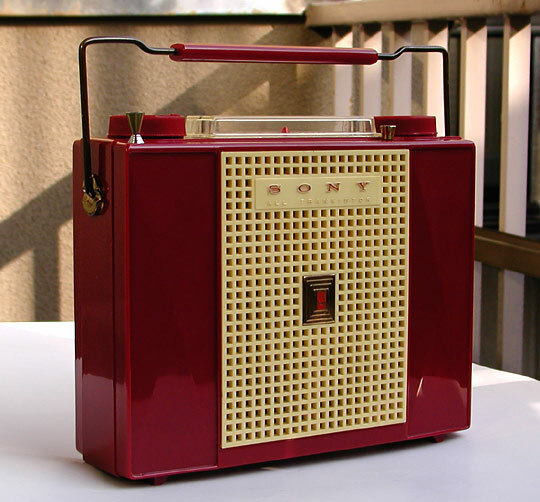 The 7-transistor TR-74 was released in November 1957 as Sony's second two-band radio, although the company cites it as their first "full-fledged" short-wave band transistor radio. This is attributable to the advent of transistors that achieved high enough performance as well as advances made in the circuitry. Tie this together with the 4" x 6" oval speaker and 180mW output and you get one great sounding radio. A little more trivia before continuing on to the next page. The TR-74 was made for a good couple of years and the earlier generation does differ cosmetically from the later one. The easy way to tell which you have is to look at the handle and the big funky screws and clip on the bottom. Earlier units use brass for these parts, while the later ones are chrome plated. Collectors also like to point out that this is the last model to display the old Sony logo on its face.